A MAC-10 with a silencer. The silencer is treated as a Title II weapon or NFA firearm itself; the firearm to which the silencer is attached maintains its separate legal status as Title I or Title II. If a silencer is integral to a Title II weapon, such as an SBR, the entire weapon only counts as a single Title II item. Title II weapons, or NFA firearms, are designations of certain weapons under the United States National Firearms Act (NFA). Title II of the Gun Control Act of 1968 is a revision of the National Firearms Act of 1934, and pertains to machine guns, short or "sawed-off" shotguns and rifles, and so-called "destructive devices" (including grenades, mortars, rocket launchers, large projectiles, and other heavy ordnance). Acquisition of these weapons is subject to prior approval of the Attorney General, and federal registration is required for possession. Generally, a $200 tax is imposed upon each transfer or making of any Title II weapon. The Bureau of Alcohol, Tobacco, Firearms, and Explosives (ATF), which enforces federal firearms law, refers to such weapons as "NFA firearms". NFA firearms include machine guns, short-barreled rifles and shotguns, heavy weapons, explosive ordnance, silencers and "any other weapon" (AOW), such as disguised or improvised firearms. Title I weapons, or GCA firearms, are standard rifles, shotguns, and handguns. Explosive devices such as bombs or grenades are regulated as NFA firearms (destructive devices). Explosive materials are not considered NFA firearms; they are regulated under the Organized Crime Control Act. A machine gun, as defined in the NFA, is "Any weapon which shoots, is designed to shoot, or can be readily restored to shoot, automatically more than one shot without manual reloading, by a single function of the trigger." The NFA term machine gun refers to all firearms capable of full automatic fire and includes true machine guns, submachine guns, and machine pistols. The frame or receiver of a machine gun, and any combination of parts intended to make a machine gun, is legally defined as a machine gun. For example, according to the ATF, "A Glock conversion switch is a part designed and intended for use in converting a semi-automatic Glock pistol into a machine gun; therefore, it is a "machine gun" as defined in 26 U.S.C. 5845(b)." Parts that can be used to convert a semi-automatic firearm to fully automatic capability are regulated as machine guns and must be registered and tax paid under the NFA. The U.S. military issued kits T17 and T18 to convert the M1 carbine to an M2, capable of fully automatic fire; these kits are legally "machine guns". It must be intended to be fired from the shoulder one shell of shot (pellets) or one projectile at a time. A rifle is a firearm designed to be fired from the shoulder and fire one bullet at a time through a rifled barrel. An SBR need not retain a shoulder stock after modification. ATF regards pistols with shoulder stocks as redesigned to be fired from the shoulder. Modern pistols with shoulder stocks and with barrels less than 16 inches long, or overall length under 26 inches, are NFA short barrelled rifles. ATF has removed some specified stocked handguns (e.g., original Mauser C96 and Luger utilizing an original shoulder stock) from the NFA as collectors' items (Curios or Relics List); ATF treats them as pistols under the GCA. The USAS-12 automatic shotgun is a "destructive device". Any explosive, incendiary, or poison gas, including bombs, grenades, rockets, missiles, mines and similar devices (e.g. grenade launchers, rocket launchers). Parts intended for making such a device are also DDs. Small rockets, with less than 4 ounces (113 grams) of propellant, are exempt. Any projectile weapon with a bore diameter greater than ​1⁄2 inch (50 caliber, 12.7 mm), except for shotguns "generally recognized as particularly suitable for sporting purposes". Most commercial shotguns have a bore diameter greater than ​1⁄2 inch, but are exempt due to their "sporting purpose"; however, both the Street Sweeper and USAS-12 shotguns, designed for military or police use, were reclassified as DDs when the ATF determined they were combat shotguns not "generally recognized as particularly suitable for sporting purposes". Line-throwing devices for marine rescue, such as lyle guns and rockets for breeches buoys. Civilian flare guns, which fire 37 mm flare caliber (1.46 inch) non-weapon rounds. Fireworks are non-weapon explosive ordnance. Flare launchers are normally exempt as they are signalling devices, not weapons; however, possession of a flare launcher and anti-personnel ammunition for it puts it in the DD category as it is then considered to be a weapon. The legal term silencer, also known as a "suppressor", is defined as "any device for silencing, muffling, or diminishing the report of a portable firearm, including any combination of parts ... intended for use in assembling or fabricating a firearm silencer." The Serbu Super-Shorty pump-action shotgun, manufactured without a buttstock, is an AOW smooth-bore handgun, not an SBS. 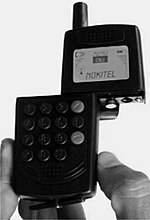 A disguised firearm such as this cell phone gun is an AOW. "Any other weapon" is a "catch-all" category. An AOW as defined as "any weapon or device capable of being concealed on the person from which a shot can be discharged through the energy of an explosive," other than a handgun with a rifled barrel". This umbrella definition includes many improvised firearms ("zip guns") and disguised firearms. Examples include wallet guns, cane guns, knife guns and pen guns. An AOW can be transferred to non-prohibited persons with a $5 BATF stamp as opposed to the $200 stamp required for machine guns and short-barreled rifles. They are smooth-bore handguns which fire shot shells, not shotguns, which must be designed to be fired from the shoulder. Many pistols feature a rail below the barrel, commonly used to mount a laser or flashlight. Attaching a vertical grip to this rail constitutes the manufacturing of an AOW firearm, as it is "no longer designed to be held and fired by the use of a single hand." It is therefore illegal to place an aftermarket vertical foregrip on any pistol without first registering it as an AOW and paying the $200 "making and registering tax". Failure to do so is a felony punishable by up to 10 years in prison. However, if the receiver was originally manufactured to accept either a long or short barrel and a removal buttstock and fore grip and it can be assembled either as a rifle or a pistol, according to ATF rule 2011-4 it is not considered an NFA weapon as long as it is only assembled as a pistol without a buttstock or as a rifle with a barrel at least 16 inches long. A vertical foregrip MAY be added to a pistol as long as the Overall Length (OAL) is greater than 26", regardless of barrel length, and providing the weapon remains unconcealed. An AR-15 pistol with an overall length of 26" or longer may have a vertical foregrip installed, as long as no buttstock is installed in conjunction with a shorter than 16" barrel. The Sig Sauer Pistol Braces (SBS and SBX) are commonly found on these AR-15 style pistols with vertical foregrips since they are not considered buttstocks. The ATF does not consider a weapon in this configuration to be an AOW, but instead classifies it as a 'Firearm' which does not require any tax stamp or additional registration. these are designed to be fired from the shoulder. An example is the Marble Game Getter an early 20th-century sporting gun sold before the NFA. These may potentially be classified as AOWs because they have a large bore and an unrifled barrel. One of the frequently asked questions on the BATF website FAQs is: "How do I obtain a classification from ATF for my "potato gun?" It is not known at present if the BATF has actually classified any potato gun as an AOW. Such a classification would require the manufacturer to either pay the $200 manufacturing tax, surrender the weapon to the BATF, or destroy it. (A) any firearm (including any firearm with a matchlock, flintlock, percussion cap, or similar type of ignition system) manufactured in or before 1898; and (B) any replica of any firearm described in subparagraph (A) if such replica -- (i) is not designed or redesigned for using rimfire or conventional centerfire fixed ammunition, or (ii) uses rimfire or conventional centerfire fixed ammunition which is no longer manufactured in the United States and which is not readily available in the ordinary channels of commercial trade. Note that a firearm manufactured before 1899 is an antique by nature of production date. A replica is of the same status provided it is either a muzzle loader, uses non-fixed ammunition (such as pinfire), or custom ammunition not commercially produced (such as conversion cartridges). Note that ATF has not defined "commercial production" for quantities of ammunition to qualify as "readily available". The ownership of Title II weapons is not illegal, but is heavily regulated at both the State and Federal level. Numerous federal restrictions are imposed on the ownership of NFA firearms, including an extensive background check initiated by the applicant's local police department or Sheriff's office. In most states, certification of the local background check is discretionary ("May-Certify"), meaning the law enforcement agency charged with initiating the background check may deny certification of the background check either arbitrarily or for reasons unrelated to the information obtained from the background check, or refuse to accept applications to start the background check process. Some states have passed "Shall-Certify" legislation requiring local law enforcement agencies to process and certify applications for those who pass the initial background check. A few states completely outlaw private citizens from obtaining NFA Title II weapons ("No-Certify"). Federal law imposes a $200 tax on manufacture or certain transfers of an NFA firearm, and a requirement for registration under the NFA. Generally, for the manufacture of NFA items, ATF Form 5320-1 must be submitted to the ATF. For the transfer of a NFA item (from a person or entity lawfully entitled to transfer it (Class 3 dealer) to oneself, or an entity (Gun Trust or LLC), the ATF Form 5320-4 must be submitted to the ATF. There is a lower, $5 transfer tax for weapons that fit in the definition of "Any Other Weapon" (AOW). Any violation of the NFA is a felony punishable by a fine of up to $250,000 and up to 10 years in prison, and any firearm involved is forfeit. Of NFA firearms (silencers, machine guns, short barrel rifles, short barrel shotguns, any other weapon (AOW) and destructive devices) machineguns are the most restricted. Since 19 May 1986, no new machineguns can be registered for private ownership. A few states, such as New York, Delaware and California, have provisions in their state laws that prohibit ownership of Title II weapons and devices. Most states allow legal ownership if the owner has complied with the federal registration and taxation requirements. A few states only allow possession of NFA firearms on the ATF Curios and Relics List, again only if the owner has complied with all federal requirements. ^ a b 26 U.S.C. § 5871. "Any person who violates or fails to comply with any provisions of this chapter shall, upon conviction, be fined not more than $10,000, or be imprisoned not more than ten years, or both." ^ See, e.g., "National Firearms Act (NFA)". www.atf.gov. ATF. Retrieved 2011-03-28. ^ "ATF Explosives Industry Newsletter : June 2004" (PDF), Federal Explosives Licensee (FEL) Newsletter, ATF, retrieved 2011-03-31, The Federal law dealing with explosive[s] is the Organized Crime Control Act, or OCCA, Title 18 U.S.C. § 841 et seq. ^ "National Firearms Act Definitions - Machinegun". www.atf.gov. ATF. Retrieved 2011-03-29. For the purposes of the National Firearms Act the term machine gun means: * Any weapon which shoots, is designed to shoot, or can be readily restored to shoot, automatically more than one shot without manual reloading, by a single function of the trigger * The frame or receiver of any such weapon * Any part designed and intended solely and exclusively or combination of parts designed and intended for use in converting a weapon into a machine gun, or * Any combination of parts from which a machine gun can be assembled if such parts are in the possession or under the control of a person. ^ "Firearms Technology FAQ". www.atf.gov. ATF. Retrieved 2011-03-29. ^ ATF NFA Handbook, Chapter 2 "What Are Firearms Under the NFA?" includes M2 Carbine conversion kit. ^ 26 U.S.C. § 5845(d). "The term "shotgun" means a weapon designed or redesigned, made or remade, and intended to be fired from the shoulder and designed or redesigned and made or remade to use the energy of the explosive in a fixed shotgun shell to fire through a smooth bore either a number of projectiles (ball shot) or a single projectile for each pull of the trigger, and shall include any such weapon which may be readily restored to fire a fixed shotgun shell." ^ 26 U.S.C. § 5845(c). "The term "rifle" means a weapon designed or redesigned, made or remade, and intended to be fired from the shoulder and designed or redesigned and made or remade to use the energy of the explosive in a fixed cartridge to fire only a single projectile through a rifled bore for each single pull of the trigger, and shall include any such weapon which may be readily restored to fire a fixed cartridge." ^ Firearms Curios or Relics List, Section III. ATF Publication 5300.11. Revised Dec 2007. ^ ATF FAQ National Firearms Act, Q: Shoulder Stock Pistol. ^ 18 U.S.C. § 921(a)(24). "The terms "firearm silencer" and "firearm muffler" mean any device for silencing, muffling, or diminishing the report of a portable firearm, including any combination of parts, designed or redesigned, and intended for use in assembling or fabricating a firearm silencer or firearm muffler, and any part intended only for use in such assembly or fabrication." ^ "National Firearms Act Definitions - Any Other Weapon". www.atf.gov. ATF. Retrieved 2011-03-29. For the purposes of the National Firearms Act, the term "Any Other Weapon" means: * Any weapon or device capable of being concealed on the person from which a shot can be discharged through the energy of an explosive; * A pistol or revolver having a barrel with a smooth bore designed or redesigned to fire a fixed shotgun shell; * Weapons with combination shotgun and rifle barrels 12 inches or more, less than 18 inches in length, from which only a single discharge can be made from either barrel without manual reloading; and * Any such weapon which may be readily restored to fire. Such term shall not include a pistol or a revolver having a rifled bore, or rifled bores, or weapons designed, made, or intended to be fired from the shoulder and not capable of firing fixed ammunition. ^ a b "Firearms Technology FAQ". www.atf.gov. ATF. Retrieved 2011-03-29. ATF has long held that by installing a vertical fore grip on a handgun, the handgun is no longer designed to be held and fired by the use of a single hand. Therefore, if individuals install a vertical fore grip on a handgun, they are "making" a firearm requiring registration with ATF’s NFA Branch. Making an unregistered "AOW" is punishable by a fine and 10 years’ imprisonment. Additionally, possession of an unregistered "AOW" is also punishable by fine and 10 years’ imprisonment. ^ "Can you add a vertical fore-grip to an AR pistol? | The Law Office of John Pierce, Esq". johnpierceesq.com. Retrieved 2015-05-29. ^ "Marble Game-Getter Gun" at Identification of Firearms Within the Purview of the National Firearms Act, ATF website. ^ 26 U.S.C. § 5872(a). "Any firearm involved in any violation of the provisions of this chapter shall be subject to seizure and forfeiture." This page was last edited on 2 February 2019, at 15:53 (UTC).